SCVHistory.com LW3240 | Saugus Speedway | William S. Hart and Friends at Hoot Gibson Rodeo, 4-30-1933. 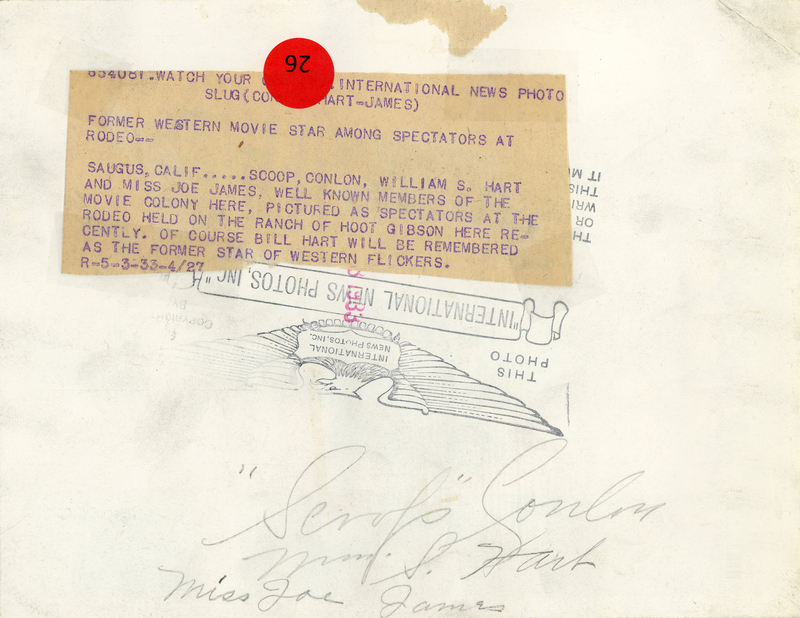 Sunday, April 30, 1933 — Western screen star William S. Hart didn't have to travel far from his Newhall home to watch the Hoot Gibson Rodeo on the south bank of the Santa Clara River, which would become the Saugus Speedway one day. At left is Hart's publicist, Paul H. "Scoop" Conlon, who took on Hart as a client in 1918 and stayed with him throughout (and obviously after) his film career (Davis 2003:124). At right is Miss Joe James. Don't know who she is. The 1933 rodeo was a qualifier, of sorts, for the 1933 Chicago World's Fair, inasmuch as the arena director for the Century of Progress Exhibition, "Skeeter Bill" Robbins, attended the rodeo to scout the best performers (Bakersfield Californian, April 21, 1933). 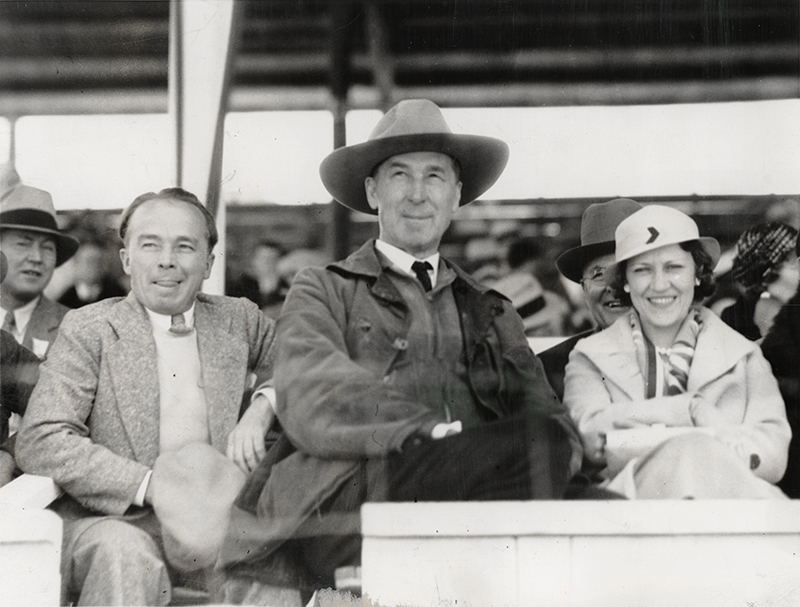 Saugus, Calif. ... Scoop Conlon, William S. Hart and Miss Joe James, well known members of the movie colony here, pictured as spectators at the rodeo held on the ranch of Hoot Gibson here recently. Of course Bill Hart will be remembered as the former star of Western flickers. Although his film career ended with a whimper in 1925, Hart probably wouldn't have appreciated being called a "former" star. The local "film colony" would have included Hart and Gibson as well as actors Harry Carey of Saugus and Hart's neighbor Charley Mack, along with a passel of luminaries who were regular vistors, such as Wallace and Noah Beery. About the Hoot Gibson Rodeo / Saugus Speedway. LW3240: 9600 dpi jpeg from original photograph purchased 2018 by Leon Worden.